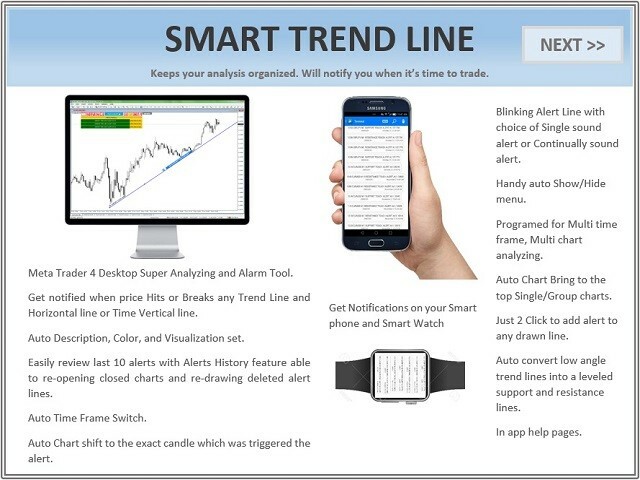 Smart Trend Line Alert is a unique professional Trend Line, Support Line and Resistance Line Touch and Break out Alert with awesome Alert History feature, designed to help traders easily manage many charts and symbols without staring at the monitor. Alerts with expiration time if not triggered. Auto convert low angle trend line into leveled support and resistance line. Chart clipper button (brings all other charts with the same symbol name to the top of other charts only for tiled charts). 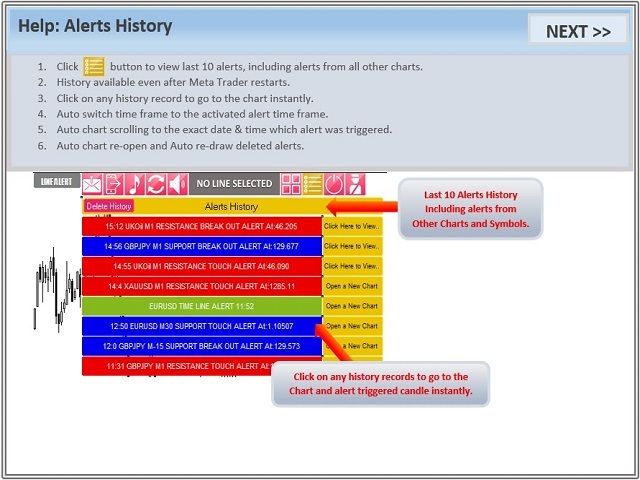 Select the line and from the menu choose desired alert type (Break Out Alert or Touch Alert). Line will keep blinking and alerting till user clicks on the line. Break out alert will be triggered only of a candle with the same time frame as alert line activated, closes above or below the line. 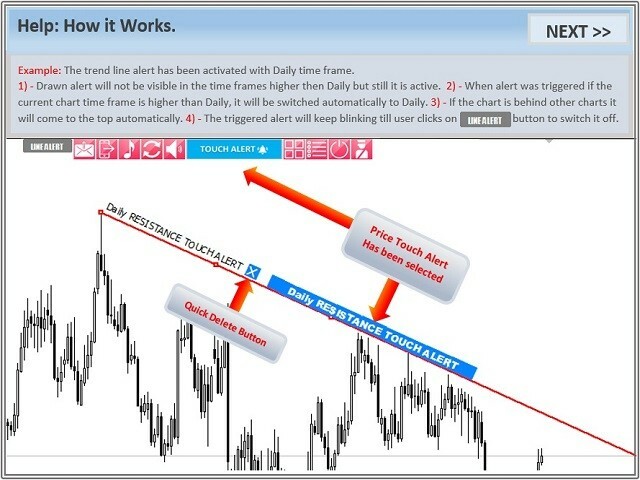 Example: The alert line description shows (Daily Support Break Out Alert). So if a daily candle closed below the line, you will receive the alert. Auto Hide Menu: Auto hide menu when no line is selected. We would like to get feedback from all users to improve our products in future versions, please do not hesitate to contact us. This is a good indicator, it does what it described. It would be nice to see some improvement. Perhaps, if the alert can be drawn on ADX and/or MACD signal line. Just what I have been looking for. Very happy! if this will be an ea that can take trade and manage it with the ability to place buy stop and sell stop same time upon breakout or touch it will make this a very sweet ea. I like the product but Author doesn't not usually respond to messaging so -1 star for that. Very good indicator, the last version is a truly good trading friend. Hopefully the next version will have a pop-up alert option. Perfect indicator. especially the sms and emal notification tool. I was searching for such indicator but I couldn't find. now this indicator works for me the best. Excellent tool, now I am getting notifications on my Iphone and also through email. Would recommend this to every one, it gives you peace of mind not to stare the screen, only check when you get the alert. Super simple but very effective. Problem with MetaTrader 4 build 971 solved. New Object detection mode has been removed. 1. Select or draw a trend line or a horizontal line. 2. A control menu appears. 3. 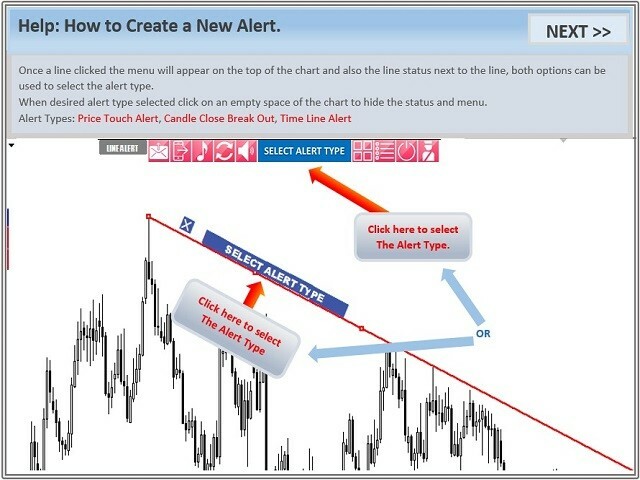 Select what kind of alert type you need for a selected line (a touch alert or a breakout one). 4. Check a selected line description for a result. - Continually Alert till user clicks on the chart. - Line blinking after it was hit. - Controlling console directly on chart. - Two extra indicator mode: click mode - just draw a line and click on it, and OFF mode. 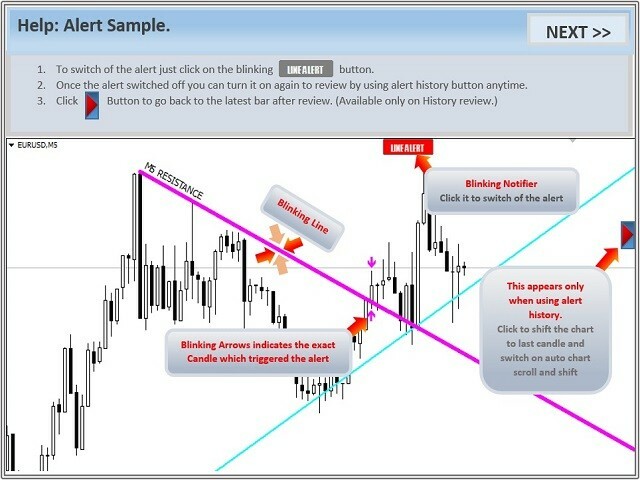 - Fast execution, no need to wait for the next tick chart.